We’d love your help. 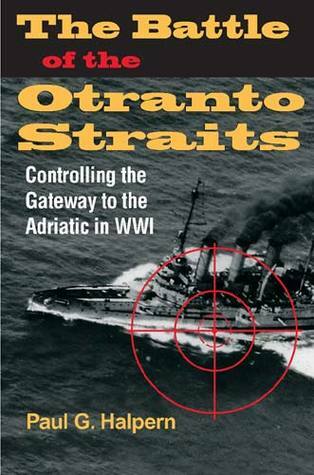 Let us know what’s wrong with this preview of The Battle of the Otranto Straits by Paul G. Halpern. To ask other readers questions about The Battle of the Otranto Straits, please sign up. Paul Halpern wrote The Naval War in the Mediterranean, 1914-1918 back in '87. Judged by the number of peers who write on the Great War at sea, it has enjoyed a comfortable reputation since as a standard work. The man treads familiar waters, floating on an impressively multilingual array of sources to give us a look at the closest thing to a Mediterranean Jutland. He certainly plunges depths akin to The Rules of the Game: Jutland and British Naval Command, starting with a mini-biography of the Kü Paul Halpern wrote The Naval War in the Mediterranean, 1914-1918 back in '87. Judged by the number of peers who write on the Great War at sea, it has enjoyed a comfortable reputation since as a standard work. The man treads familiar waters, floating on an impressively multilingual array of sources to give us a look at the closest thing to a Mediterranean Jutland. He certainly plunges depths akin to The Rules of the Game: Jutland and British Naval Command, starting with a mini-biography of the KüK marine. Custom commissioned maps convey the peculiar environment of the narrow sea, where coastal artillery and small surface ships could easily outmatch Dreadnoughts like ants to a termite. Termites who had eyes in the air that prefigure Taranta in 1940. This made possible the "Serbian Dunkirk" on the beaches of Albania, the mid-winter evacuation to Corfu Conversely, tactical support from battleship's main armament could decide the outcome of a terrestial fight, as it did at Montenegro. Submarines felt more at home in the Adriatic, both domestic Habsburgs and German imports, disassembled and transported overland. In turn, even wooden motorboats armed with torpedoes launched from the east coast of Italy could face them. Even nets - linked to mines and alerts for depth charge-toting surface vessels - were not without success. The powerful Allied fleet at Brindisi put the cork on the narrows at Oranto. If not, towed subs could've threatened the naval expedition to Gallipoli, for example. Inevitably, there was a showdown between the capital ships.